Postural control is required not only for proper body position in space but is the basis on which movements are organized and executed either via anticipatory or reactive mechanisms. First, the antigravity function of posture provides the mechanical support necessary for the upright position. Second, a balance needs to be maintained during movement execution. Third, posture serves as a reference frame for organizing body and limb movements. Soon after hospital discharge, the individuals with stroke are at increased risk for falls. The ability to react to a balance perturbation is critical to maintain balance and prevent falls. Impaired reactive stepping is a prevalent problem for ambulatory patients with stroke preparing for discharge. It's important to test the capacity to safeguard from fall induced by perturbation and stepping reactions may be important to identify those at risk for falls and to direct appropriate intervention strategies. Compared to young individuals, elderly subjects more often rely on stepping strategies as opposed to ankle or hip strategies to recover balance following a postural perturbation (Jensen et al. 2001; Maki et al. 2000; McIlroy and Maki 1996). So the ability to initiate a quick and efficient step is a critical factor for postural control in this population. Stroke patients especially the elderly group demonstrates impaired anticipatory postural adjustments, delays in timing, an inability or unwillingness to initiate a step with the paretic limb, and the use of multi-step responses or the need for assistance to regain stability. Reactive postural control mechanisms govern the fast, feedback-driven corrections that appropriately redirect foot placement when necessary. Salbach et al. (2004) demonstrated task-specific training of lower extremities designed to strengthen the lower extremities and enhance walking balance, speed, and distance showed improvement in a number of gait parameters. Treadmill training has been used as a form of gait specific training despite conflicting evidence as to whether or not it is more beneficial than standard gait training. Moseley et al. (2003) conducted a meta-analysis to determine the effectiveness of treadmill training and body weight support for walking after stroke. The authors found that, as compared to other physiotherapy interventions, treadmill training (with and without other task-oriented exercises) had no significant effects on walking speed. Nevertheless, there has been some indication that more aggressive progressive training programs may help to improve the effectiveness of treadmill training. For example, Pohl et al. (2002) found that stroke patients who received structured speed-dependent treadmill training scored significantly higher on measures of walking speed, cadence, stride length, and functional ambulation after 4 weeks of training. 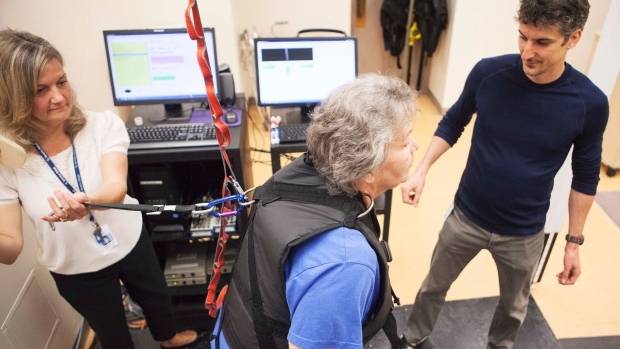 Partial body weight support and treadmill training is a promising new approach that enables non-ambulatory stroke survivors the repetitive practice of complex gait cycles rather than single limb gait preparatory maneuvers. Functional electrical stimulation (FES) in the lower extremity has been used to enhance ankle dorsiflexion during the swing phase of gait. Weak ankle dorsiflexion with plantarflexion hypertonicity results in a drop foot, which is typically corrected by an ankle-foot orthosis (AFO). FES of the common peroneal nerve during the swing phase of gait would appear to be a suitable alternative. Although not widely used or universally available, for highly motivated patients, able to walk independently or with minimal assistance, there is growing evidence that treatment with FES can improve dropped foot, which in turn can improve gait. Both implantable and surface electrodes may be used. A meta-analysis by Glanz et al. (1996) including four RCTs (Bowman et al. 1979, Winchester et al. 1983, Merletti et al. 1978, Levin 1992), reported a favorable treatment effect associated with FES compared to a no treatment control. The effect size associated with a statistically significant change in paretic muscle force of contraction was 0.63 (95% CI 0.29, 0.98), although the clinical significance of this outcome is unclear. There were no other common outcomes among the four included studies. ↑ Shih-Chiao Tseng, Doctor of Philosophy, 2008 Impaired reactive postural control in the elderly during voluntary stepping. ↑ Inness EL, Mansfield A, Lakhani B, Bayley M, McIlroy WE.Impaired reactive stepping among patients ready for discharge from inpatient stroke rehabilitation.Phys Ther. 2014 Dec;94(12):1755-64. doi: 10.2522/ptj.20130603. Epub 2014 Aug 7.